Award-Winning Sportfishing Destination and Eco-Resort. If you are looking for a world-class fishing experience in Costa Rica, it is hard to find a better choice than Crocodile Bay Resort. Located on Costa Rica’s southern Pacific coast, this remote resort allows a sportfishing experience like few others, with billfishing for sailfish, striped, blue and black marlin, dorado, and tuna, just to name a few. Located on over 40 acres of stunning tropical gardens, the resort offers 28 air-conditioned rooms, perfect for resting after a long day on the water. You’ll be amazed daily by the wildlife just outside your window! Local residents you may spot include wild scarlet macaws, parrots, toucans, iguanas, and even the famous Jesus Christ Lizard as he runs across the water. At Crocodile Bay, you will not only have the chance to catch the fish of your dreams, you’ll also be able to taste your catch! Whether it be tasty ceviche, fresh sushi, or grilled to perfection, your catch can be prepared as you wish. And, of course, you can always choose the fresh selections that are at the restaurant itself, accompanied by delicious local produce. After a day fishing, there may be nothing better than a relaxing massage. And the resort’s spa aims to please. The modern 5,000-square-foot spa offers more than 30 customizable therapies, virtually guaranteeing that the treatment you want will be available. Special touches include locally grown organic fruits and herbs. Not a spa person? Not a problem – there are plenty of other ways to get some R&R at the resort! The pool area is a great place to spend some time swapping fishing stories with friends both old and new. Check out the swim-up bar and the elevated Jacuzzi, where the sights and sounds of the jungle will remind you just how special a place you have chosen to visit. Of course, the real attraction at Crocodile Bay is the sportfishing! The resort has the largest professional sportfishing team in Central America with in-house captains and mates able to cater to all skill levels. Their fleet of Boston Whalers and Strike Yachts is easily accessed from the 800-foot private pier and includes 24’ center consoles, 27’ offshore center consoles, and 33’ and 35′ tower boats. Crocodile Bay also prides itself on its variety, offering offshore, inshore, kayak, and shore fishing excursions, including fishing options such as live bait, trolling, casting, and Costa Rica fly-fishing. 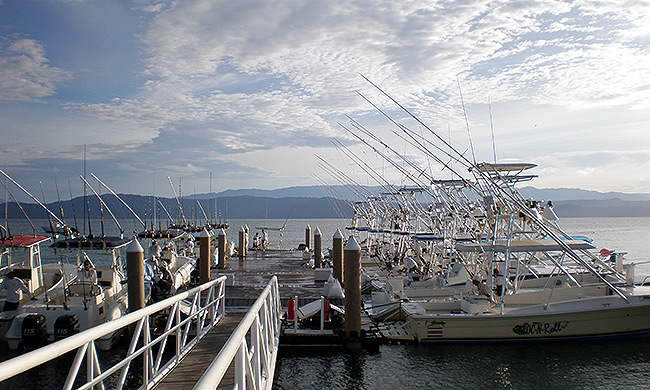 Some of the fish that inhabit the waters of the Golfo Dulce include marlin, sailfish, dorado, tuna, cubera snapper, jack crevalle, bluefin trevally, sierra mackerel, tripletail, and grouper, depending on the time of the year. Puerto Jiménez itself is considered one of the world’s best destinations for the famous roosterfish! All meals, non-alcoholic drinks, appetizers in the bar daily, and wine at dinner, as well as round-trip transportation to Puerto Jimenez airstrip. Use of paddleboards to tour the gulf and mangrove river as well as Crocodile Lagoon viewing are also included. Alcoholic beverages at the resort.